“If I can only go to one restaurant in Orlando, where should I GO? is a question I get often. I have a long list of favorites around town, based on type of cuisine and ambience, from casual to fancy to pseudo-hipster, so to narrow down to only one choice is not easy. I imagine it’s the equivalent of being asked to pick a favorite child. 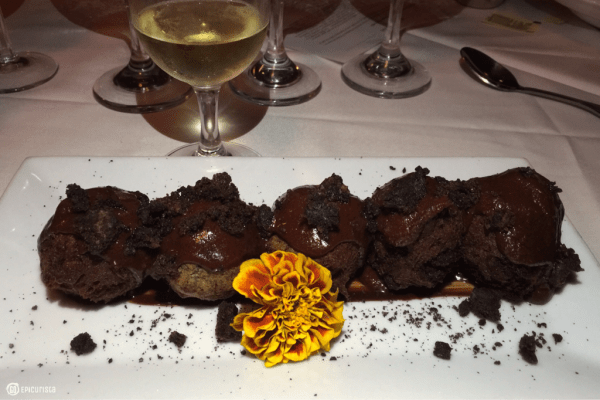 Yet K Restaurant and Wine Bar, one of the first chef-owned and operated restaurants in Orlando, is in my opinion, a quintessential Orlando restaurant that should be on everyone’s #MustEat List when in The City Beautiful. Chef / Owner Kevin Fonzo shows a true passion for food, the community and the Central Florida culinary scene. For the past 14 years, in his cozy 1930’s bungalow restaurant, he’s been wowing foodies with some of the finest American cuisine with eclectic influences. Often Italian, other times Southern or Caribbean, but always driven by fresh ingredients and an authentic farm or garden to table approach using local farms and food purveyors as well as his own backyard garden for inspiration. This is enough to garner a high recommendation on my part, yet it is what he does so often outside of the restaurant that makes Fonzo and K Restaurant a favorite. Chef Fonzo has been an active contributor of the Edible Schoolyard program at the Orlando Junior Academy, teaching kids about nutrition, sustainable farming and food preparation. A program, I believe, should be in every school across America if we truly want to eradicate childhood obesity. He was recognized at the White House by First Lady Michelle Obama for his efforts. If that was not enough, he established the Kevin Fonzo Foundation to further promote this mission. He participates in countless charity and community events throughout the year and he promotes Central Florida at James Beard Foundation Events (a past nominee himself for Best Chef-South) to ensure Central Florida makes its mark on the culinary map of America, and the world. I don’t know where he finds the time to do all this other than to say he has a great team working with him at K Restaurant. I value restaurant chefs and owners that have that kind of commitment and passion, who not only have the culinary talent but also the heart to go beyond the walls of their establishment and into the community. In turn, the community should show their support. The full reservation list at K Restaurant is a sure sign the Orlando community does. K Restaurant is participating in Bite30 all through the month of June. Orlando Weekly’s 30-day “Restaurant Week” promotion offers both locals and visitors the opportunity to dine at fantastic restaurants around Orlando at a fraction of the cost. For only $30 you get to choose three courses from a set dinner menu. I love seeing that despite K Restaurant’s popularity, it continues to participate in local initiatives like this, often meant to drive traffic during slow times, which at K Restaurant I imagine are rare. The menu of course did not disappoint. 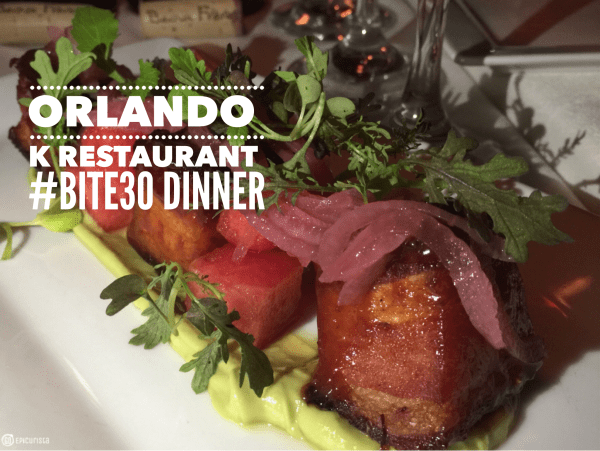 I dined with some friends recently and we ordered from the #Bite30 menu as well as their A La Carte Menu. It was their first time at K Restaurant, but I know it won’t be their last. Here’s a recap of our dinner. 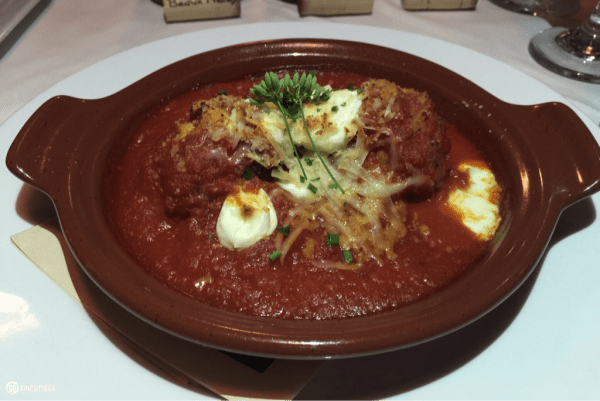 Get ready to drool and then pick up the phone, make your reservation and GO soon. 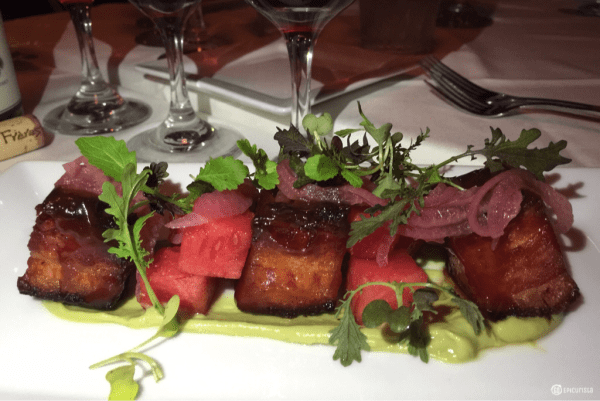 ^ BBQ Palmetto Creek Farms Pork Belly with watermelon, greens from the Garden, pickled onion and avocado cream ($10). I don’t need to say anything more than “Pork Belly” perfection. BBQ Pork Belly, oh my! These were nice and meaty with a fresh tangy and sweet tomato sauce and the only thing missing was a mound of spaghetti under them. Italian Sausage Meatballs, Mamma Mia! Also on the menu is a choice of Cold Water Oysters with Cucumber Mignonette. K Restaurant offers a wide range of small plates and salads to suit your casual adventurous mood like Pig Ear Tacos or Deviled Eggs to your elegant foodie splurge like Bone Marrow Tar Tar or Chicken Liver Mousse. Southern influences abound with dishes like Creole BBQ Shrimp and Fried Green Tomatoes. The entire menu is an homage to authentic Farm to Table, eating local and the Sunshine Plate movement, showcasing product from local purveyors Lake Meadow Naturals, Palmetto Creek Farms, Tomazin Farms, Frog Song and others as well as his own backyard garden, so expect the menu to change regularly with the season. I only wish my mom had made deviled eggs like this at our family parties. That tomato jam was amazing. ^ My friend ordered the Fried Green Tomato with crab-roasted corn salad, grain mustard dressing ($13) as her starter course and proclaimed her first visit to K a success simply on the merits of this dish. 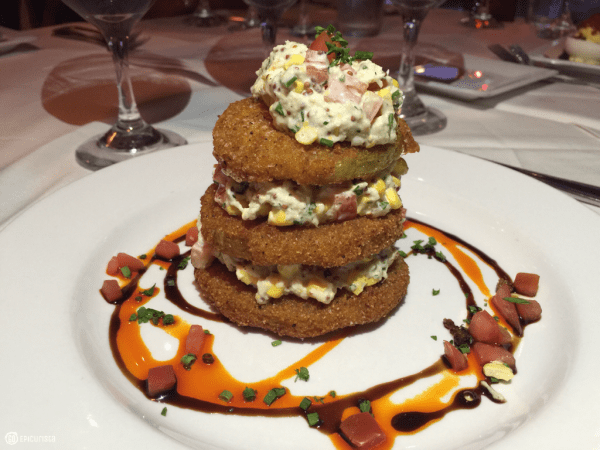 The contrast of textures with the crunch of perfectly fried tomatoes and the creamy crab salad and the layers of flavor have made this dish a popular staple on the K Restaurant for years. 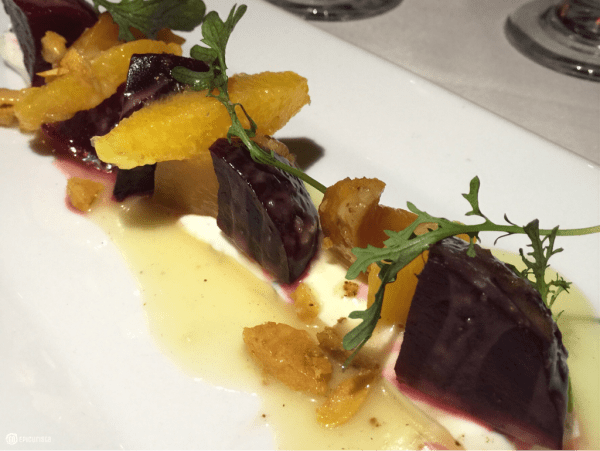 ^ Roast Beets from Tomazin Farms with whipped Turtle Creek goat cheese, orange, pistachio and cumin ($8). A beautiful representation of local ingredients. The whipped goat cheese was a nice surprise. 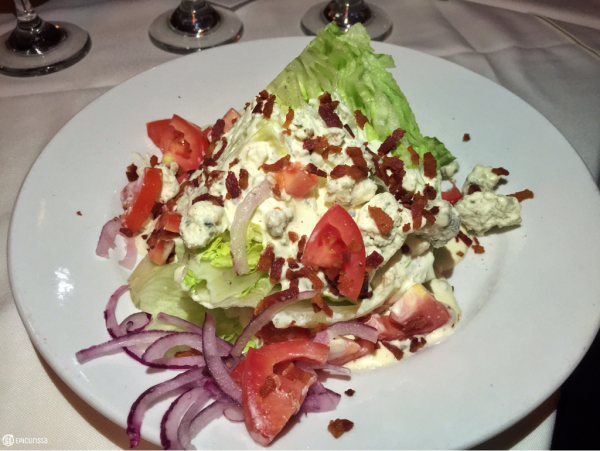 ^ Wedge Salad with Iceberg, Green Goddess Dressing, tomato, blue cheese, onion and bacon ($8). This is what a wedge salad should be, practically a meal. The dressing was bright, tangy and full of flavor. You don’t see this classic 1920’s dressing much but it must be making a resurgence and I loved it. The Wedge to rule all Wedges! 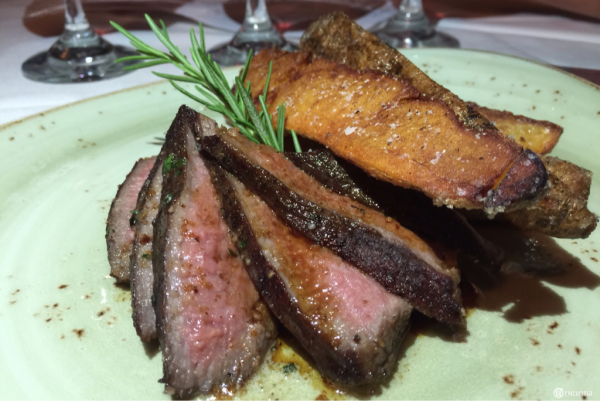 ^ Roast Tri-Tip with crispy steak fries, bone marrow butter, Cabernet Sauvignon sauce. The Tri-Tip was perfectly seared and cooked to a nice medium-rare temperature. The Cabernet sauce and bone marrow butter gave it a beautiful richness of flavor but the spotlight on this dish went to those amazing crispy on the outside and soft on the inside steak fries. Sweet Epicurista Heaven! I am not a potato person and these had me stealing from my BF plate more than once. I can only assume they are cooked in some sort of heavenly fat, maybe pork belly or duck or who knows, but seriously, everyone at the table was raving. To do that with potatoes, when the rest of the meal is already at a pretty high rave-worthy level, is pure culinary genius. Roast Tri-Tip and Oh my those potatoes! 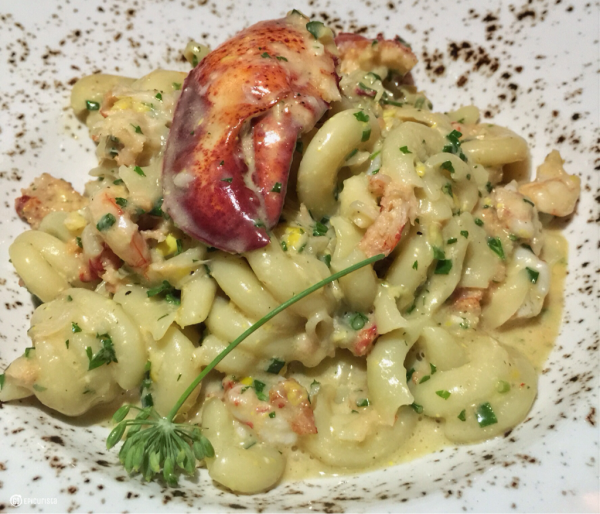 ^ Cape Canaveral Royal Red Shrimp with Lobster, Pasta, Roast Frog Song Sweet Corn butter was a hearty dish full of shrimp topped with a gorgeous lobster claw. The corn butter and fresh herbs made what could be an otherwise plain pasta dish, truly spectacular. The third choice on the #Bite30 menu was Roast Lake Meadow Naturals Chicken with local sweet corn, pole bean and bacon succotash. Italian and Southern influences abound in the entree category with comfort foods like Italian Sausage Mac n’ Cheese, Ricotta Gnocchi with Pig head ragu, Eggplant Parmesan, Duck Breast with roasted butternut squash, Farro and sundried tomatoes and Pork Chop with Bradley’s Country store grits, sweet corn and roast BBQ sweet onion. 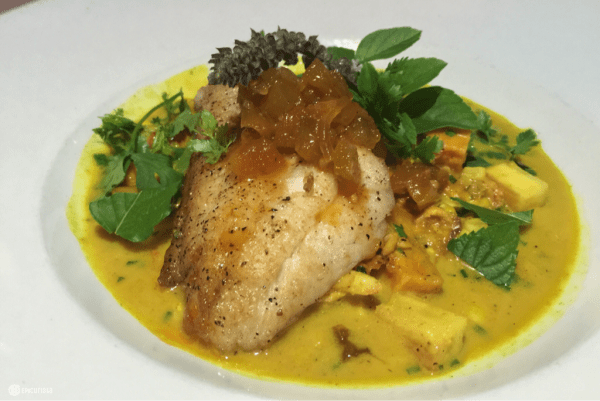 The dish that most caught our eye was Florida Parrotfish with Coconut Lobster chowder, curry, sweet potato, yucca, sweet corn and green tomato chutney ($24). It had a beautiful medley of Caribbean flavors and bright colors that popped off the plate. The fresh Thai basil, mint and cilantro from the garden gave it a fresh burst of flavor. It was not only beautiful to look at but gorgeous to taste. Parrotfish and a medley of flavors! Pastry Chef Michelle Hulbert is the Goddess of the Sweets! For me, a meal is not complete without dessert. I often plan my dinner around what that final course of heaven will be. At K Restaurant, with Michelle’s daily creations, you are guaranteed to end the meal as perfectly as it started. ^ Michelle’s Cheesecake of the Day was a triple berry treat that reminded me of my favorite strawberry cupcake from local Blue Bird Bake Shop. 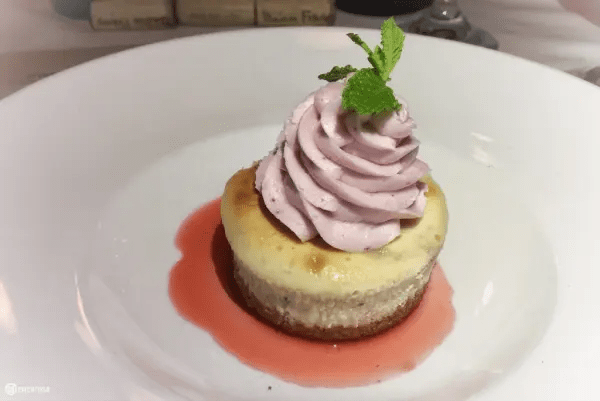 It had a beautifully dense cheesecake topped with a berry buttercream icing that offered the perfect balance of sweetness and decadence. ^ Ice Cream Cookie Sandwich Whim of the day was a Double Chocolate Chip cookie with Peanut Butter Ice Cream made in house. You can taste the difference. This was a dessert that made me feel like a kid. So good. 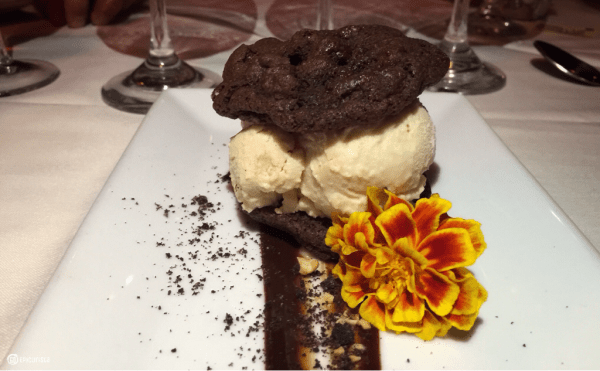 Homemade ice cream and cookies never tasted this good! Again, I must emphasize, at K Restaurant you must leave room for dessert. 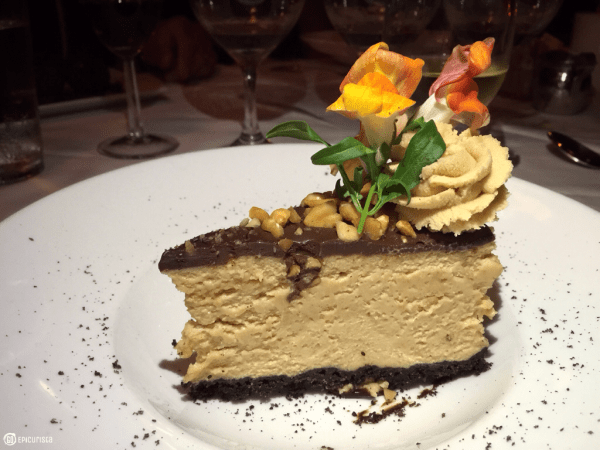 ^ Peanut Butter Pie with Peanut Butter Mousse, chocolate wafer crust, and Peanut Butter buttercream ($9) is everything a peanut butter pie should be. Is there any better dessert combination than peanut butter and chocolate? I don’t think so. I can’t say enough about this pie or it’s beautiful presentation. The most sinful Peanut Butter Pie on earth! ^ Ricotta Donuts ($9) with Brownie Chocolate chip, and chocolate glaze. It was National Doughnut Day and these were the the perfect way to celebrate. Perfectly crisp outside with warm and moist inside. I only wish there was ice cream to go with them (but then again I wish everything came with ice cream). 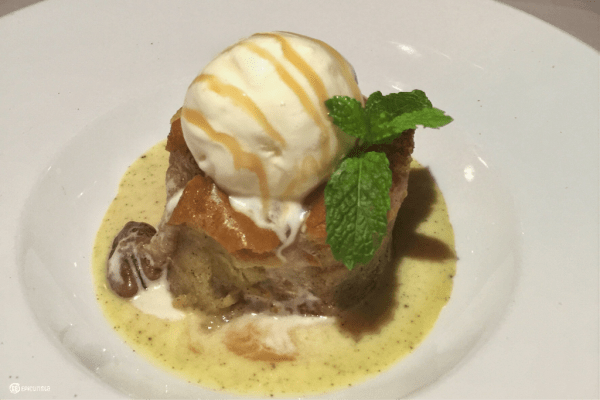 ^ French Toast Bread Pudding ($9) with pecan streusel, vanilla ice cream, cinnamon creme anglaise. Oh my! Again, something so simple as french toast is taken to a whole new level of greatness. French Toast Bread Pudding, enough said. I would be remiss if I only talked about the food at K Restaurant and didn’t mention the wonderful staff that works there. Our server on this night as well as on many occasions in the past, was Rocky, a larger than life personality that regales you with show tunes while perfectly attending to your needs. He must have come with the building and not been allowed to leave because he is a fixture at K, and that’s a great thing. Hearing about his meeting with the divine Bette Middler had us all in stitches. At the end of this meal, we were all thoroughly and pleasantly satiated and already making plans for our return visit. I must try all of Michelle’s desserts! Are you drooling now? I hope so. 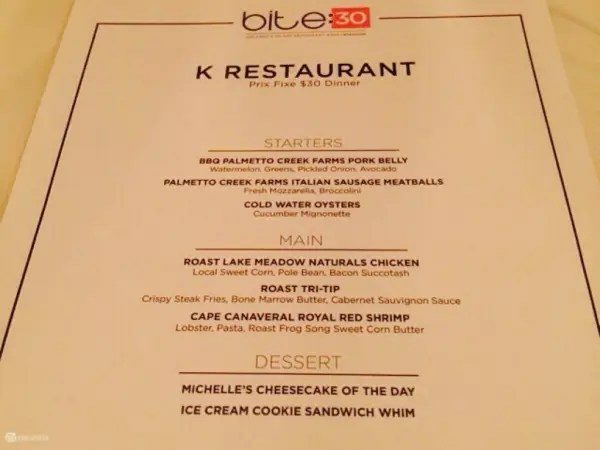 GO get your friends together and take advantage of the #Bite30 menu at K Restaurant until June 30th. Your taste buds and your friends will thank you. 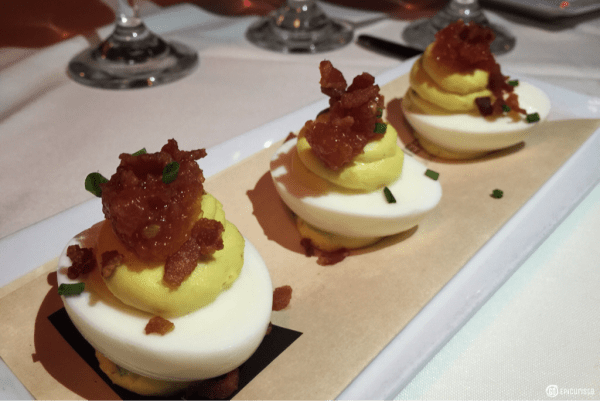 If you want more foodie inspiration and fun events to GO celebrate, #Bite30 and Bite Night are on the Top 9 List for Can’t Miss Food & Wine Events in Orlando this June. K Restaurant is located at 1710 Edgewater Drive, in the College Park neighborhood of Orlando, Florida. (407) 872-2332. Reservations are strongly recommended. Follow Chef Kevin Fonzo on Twitter and Instagram.